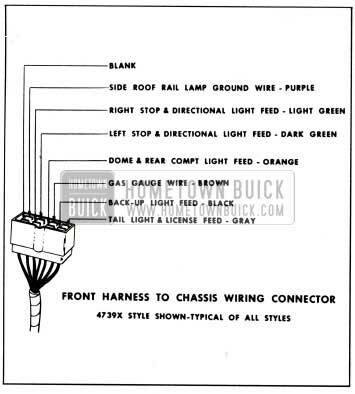 The 1959 styles incorporate a newly designed wire harness for the power operated windows, ventilators and seats. 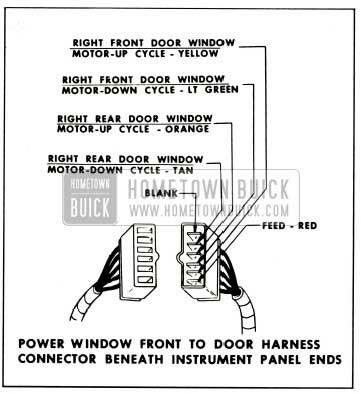 The power window harness now consists of a separate left window harness which controls the operation of the left doors and quarter windows, a separate right window harness which controls the operation of the right door and quarter windows, and a power window front harness which completes the circuit from the left door windows to the right door windows. 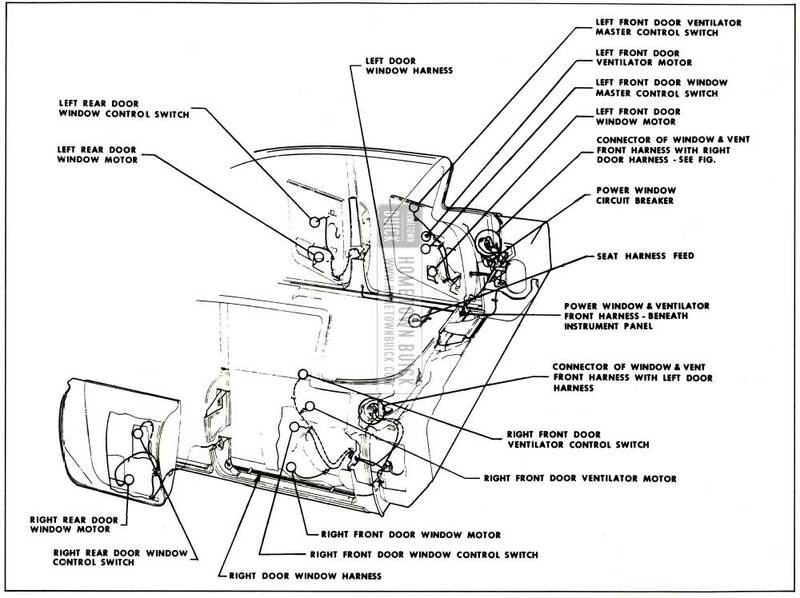 The connections of the right and left window harnesses to the front harness are located beneath the outer ends of the instrument panel as indicated in Figures 8-1 thru 8-7. 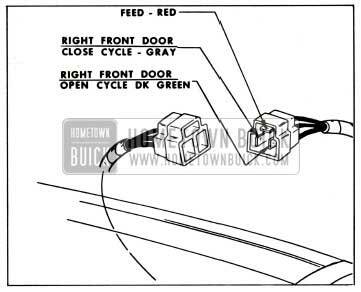 The right and left window harness consists of a front door window harness and a rear door or a rear quarter window harness. The front and rear harnesses are connected together beneath the outer ends of the instrument panel. The power ventilator harness is designed similar to the power window harness. It consists of a power ventilator front harness and a left door ventilator and a right door ventilator harness. 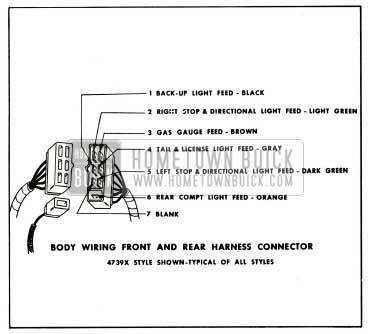 The connections for these harnesses are also located beneath the instrument panel. The current for all of the electrical circuits is provided by a twelve volt battery. All of the circuits are protected by a circuit breaker located beneath the instrument panel at the left shroud. 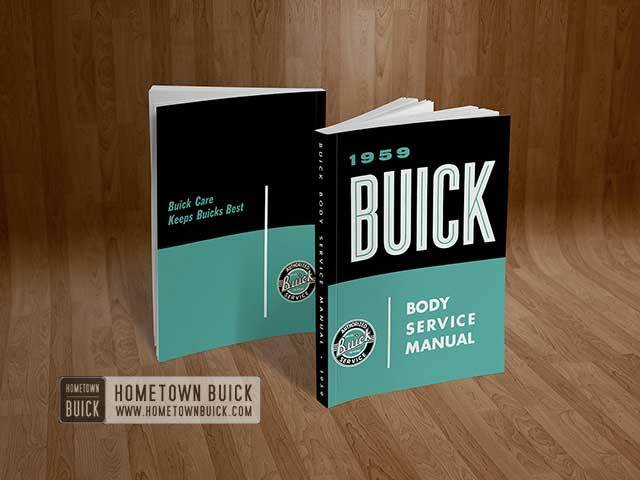 The power windows incorporate a new rectangular shaped motor. 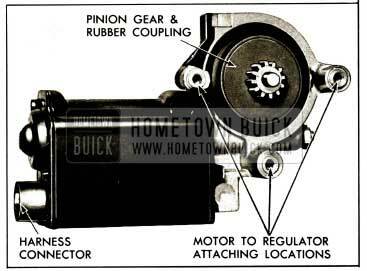 The motor is a 12 volt D.C., split series, reversible direction motor with an internal circuit breaker and a self-locking rubber coupled gear drive. See Figure 8-8. 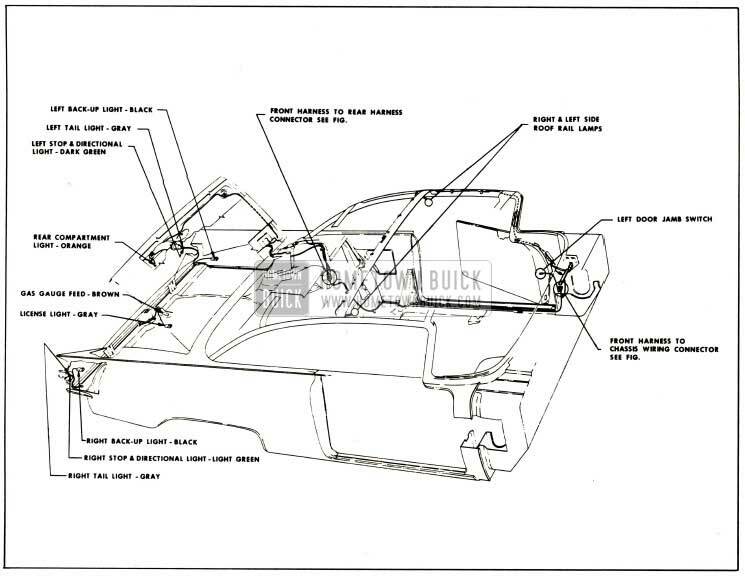 NOTE: Early production bodies will be equipped with the round type motor used on past models. The six-way and electric horizontal seat circuits are completely different from last year. 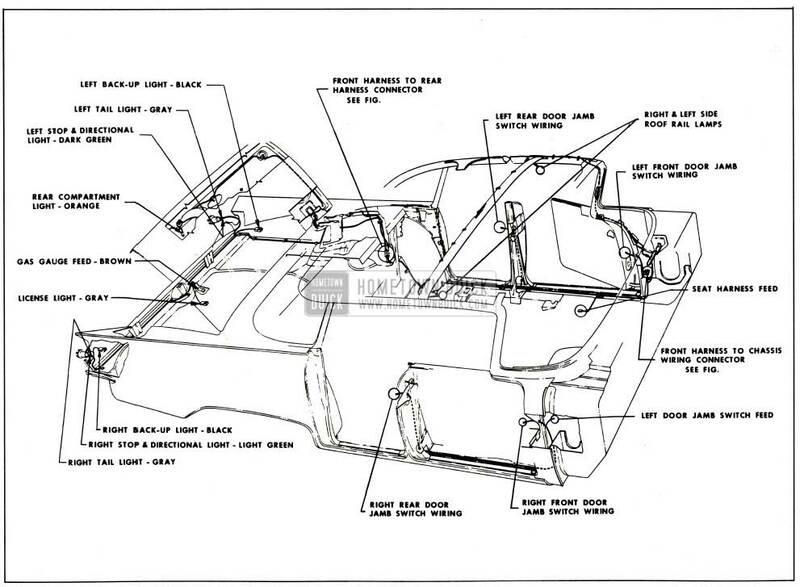 The six-way seat incorporates a separate motor for each of the three basic movements of the seat. Vertical movement of front edge of seat. Vertical movement of rear edge of seat. The power ventilators incorporate a 12 volt D.C. motor with a self-locking gear drive and an internal circuit breaker. The motor case is round similar to past model window motors. Failures in a circuit are usually caused by short circuits or open circuits. Open circuits are usually caused by breaks in the wiring, faulty connections, or mechanical failure in a component such as a switch or circuit breaker. Short circuits are usually caused by wires from different components of the circuit contacting one another or by a wire or component grounding to the metal of the body. In locating a short or open circuit, the checking procedures in this section refer to the use of a light tester to check for presence of current. To use a light tester, contact one lead with the terminal or wire being checked for presence of current, and ground the remaining light tester lead to the body metal. If tester bulb lights, current is present at wire being checked. If tester does not light, there is no current present at wire being checked. Before performing an intensive checking procedure to determine the cause of an inoperative electrical unit(s) be sure to check wiring harness connectors for proper installation.